What is Online Reputation Management? 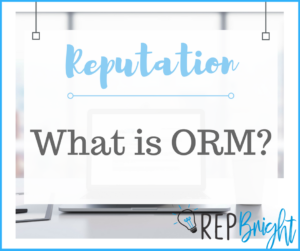 Learn more about ORM today! What is Online Reputation Management? Online Reputation Management, or ORM, is the practice of crafting strategies that shape or influence the public perception of an organization, individual or other entity on the Internet. When used for good, ORM is an effective tool that can influence or help drive public opinion about a business, its employees, and its products and services. There are many misconceptions about ORM, as many people think it is simply social media management or PR for the Internet. Others think that reputation management involves utilizing questionable practices to make a bad brand look good online. The truth is, reputation management is so much more than either of those misconceptions. Online reputation management encompasses every facet of your brand online, from your website, all the way down to your employees’ interactions with others on social media, and everything in between. Today, we are going to break it down for you and explain what exactly ORM is, and how it can benefit you. Originally focused on by PR professionals, ORM was focused on a combination of search results and brand interaction with their followers online. Now that so much of our day to day brand interactions are online, ORM is no longer just for multi-billion dollar companies with large PR budgets. Actively monitoring and managing your brand or personal reputation is a critical element in today’s Internet-centric world. Much of the worth of a brand is determined by what is being said about that brand online. What are people saying about you? If they’re saying something bad, or maybe even worse – not saying anything, you are headed for trouble. How do we stop negative conversations, or create buzz where there currently isn’t any? Effective online reputation management involves many moving parts, including monitoring of the reputation of an individual or a brand online, addressing any potentially damaging content, and using customer feedback to solve problems before they become damaging to the reputation of the brand. A critical component of effective reputation management includes suppressing negative search results, while highlighting and promoting positive ones. The key to effective reputation growth is doing so in a way that does not bring the ethics of the brand into question. Some great ways to do this include requesting reviews from happy customers, resolving issues and making things right when someone does have a problem, creating great content that gets shared online, and of course, running a great business. For most brands, great reputation management also involves bridging the gap between how a company perceives itself and how others view it. Oftentimes, the way a brand sees itself is vastly different than the public’s perception of the brand. This can be detrimental to the brand’s online success. How do you determine how the public sees your brand or industry? Take a look at popular social sites online, and see what people are saying. Ask questions, and really listen to the answers you receive. Quite often, people will give you their honest opinion. If you’re willing to listen, this information is incredibly valuable. Here at RepBright, we promote positive, ethical online reputation management and brand growth practices. Yes, there are other ways to do things, and sometimes those practices yield quick results. However, the truth always comes out, and the Internet has an incredibly wrong memory. We find that doing things right and not cutting corners always works out best in the end. One thing that the general public and the search engines have in common is that they do not like being gamed or underestimated. Trying to beat the system rarely ends well. We have found great success in being honest, transparent, and ethical. Listening to your audience and cultivating a brand that they want to do business with is a great platform for success, both online and off. Want to learn more? Follow us on Facebook for ORM tips and conversation!